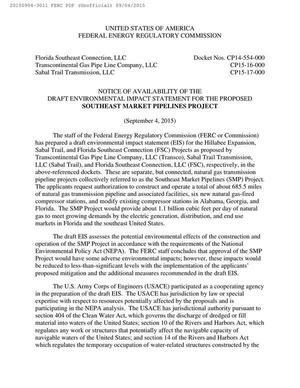 The staff of the Federal Energy Regulatory Commission (FERC or Commission) has prepared a draft environmental impact statement (EIS) for the Hillabee Expansion, Sabal Trail, and Florida Southeast Connection (FSC) Projects as proposed by Transcontinental Gas Pipe Line Company, LLC (Transco), Sabal Trail Transmission, LLC (Sabal Trail), and Florida Southeast Connection, LLC (FSC), respectively, in the above-referenced dockets. These are separate, but connected, natural gas transmission pipeline projects collectively referred to as the Southeast Market Pipelines (SMP) Project. 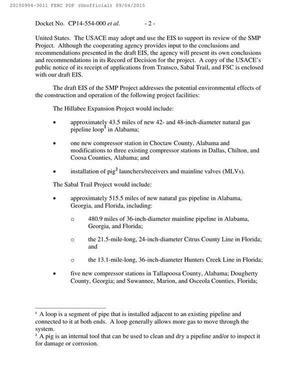 The applicants request authorization to construct and operate a total of about 685.5 miles of natural gas transmission pipeline and associated facilities, six new natural gas-fired compressor stations, and modify existing compressor stations in Alabama, Georgia, and Florida. The SMP Project would provide about 1.1 billion cubic feet per day of natural gas to meet growing demands by the electric generation, distribution, and end use markets in Florida and the southeast United States. The draft EIS assesses the potential environmental effects of the construction and operation of the SMP Project in accordance with the requirements of the National Environmental Policy Act (NEPA). The FERC staff concludes that approval of the SMP Project would have some adverse environmental impacts; however, these impacts would be reduced to less-than-significant levels with the implementation of the applicantsâ€™ proposed mitigation and the additional measures recommended in the draft EIS. The U.S. Army Corps of Engineers (USACE) participated as a cooperating agency in the preparation of the draft EIS. The USACE has jurisdiction by law or special expertise with respect to resources potentially affected by the proposals and is participating in the NEPA analysis. The USACE has jurisdictional authority pursuant to section 404 of the Clean Water Act, which governs the discharge of dredged or fill material into waters of the United States; section 10 of the Rivers and Harbors Act, which regulates any work or structures that potentially affect the navigable capacity of navigable waters of the United States; and section 14 of the Rivers and Harbors Act which regulates the temporary occupation of water-related structures constructed by the United States. The USACE may adopt and use the EIS to support its review of the SMP Project. Although the cooperating agency provides input to the conclusions and recommendations presented in the draft EIS, the agency will present its own conclusions and recommendations in its Record of Decision for the project. A copy of the USACEâ€™s public notice of its receipt of applications from Transco, Sabal Trail, and FSC is enclosed with our draft EIS. installation of pig2 launchers/receivers and mainline valves (MLVs). installation of pig launchers/receivers, MLVs, and meter and regulating stations. Any person wishing to comment on the draft EIS may do so. To ensure consideration of your comments on the proposal in the final EIS, it is important that the Commission receive your comments by October 26, 2015. 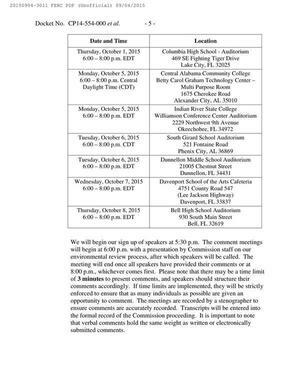 For your convenience, there are four methods you can use to submit your comments to the Commission. In all instances, please reference the appropriate docket numbers (CP14-554-000 for the FSC Project; CP15-16-000 for the Hillabee Expansion Project; or CP15-17-000 for the Sabal Trail Project) with your submission. 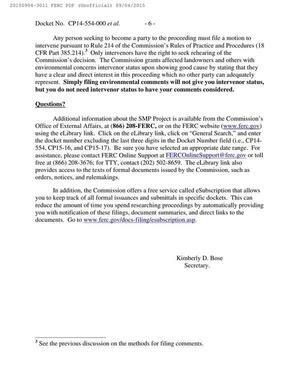 The Commission encourages electronic filing of comments and has expert staff available to assist you at (202) 502-8258 or efiling@ferc.gov. Please carefully follow these instructions so that your comments are properly recorded. We will begin our sign up of speakers at 5:30 p.m. The comment meetings will begin at 6:00 p.m. with a presentation by Commission staff on our environmental review process, after which speakers will be called. The meeting will end once all speakers have provided their comments or at 8:00 p.m., whichever comes first. Please note that there may be a time limit of 3 minutes to present comments, and speakers should structure their comments accordingly. If time limits are implemented, they will be strictly enforced to ensure that as many individuals as possible are given an opportunity to comment. The meetings are recorded by a stenographer to ensure comments are accurately recorded. 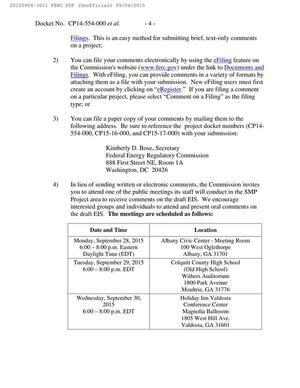 Transcripts will be entered into the formal record of the Commission proceeding. It is important to note that verbal comments hold the same weight as written or electronically submitted comments. Any person seeking to become a party to the proceeding must file a motion to intervene pursuant to Rule 214 of the Commissionâ€™s Rules of Practice and Procedures (18 CFR Part 385.214).3 Only intervenors have the right to seek rehearing of the Commissionâ€™s decision. The Commission grants affected landowners and others with environmental concerns intervenor status upon showing good cause by stating that they have a clear and direct interest in this proceeding which no other party can adequately represent. Simply filing environmental comments will not give you intervenor status, but you do not need intervenor status to have your comments considered. Additional information about the SMP Project is available from the Commissionâ€™s Office of External Affairs, at (866) 208-FERC, or on the FERC website (www.ferc.gov) using the eLibrary link. Click on the eLibrary link, click on â€œGeneral Search,â€ and enter the docket number excluding the last three digits in the Docket Number field (i.e., CP14-554, CP15-16, and CP15-17). Be sure you have selected an appropriate date range. For assistance, please contact FERC Online Support at FERCOnlineSupport@ferc.gov or toll free at (866) 208-3676; for TTY, contact (202) 502-8659. The eLibrary link also provides access to the texts of formal documents issued by the Commission, such as orders, notices, and rulemakings. In addition, the Commission offers a free service called eSubscription that allows you to keep track of all formal issuances and submittals in specific dockets. This can reduce the amount of time you spend researching proceedings by automatically providing you with notification of these filings, document summaries, and direct links to the documents. 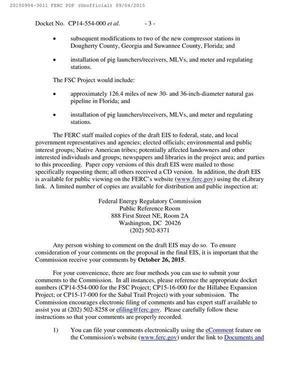 Go to www.ferc.gov/docs-filing/esubscription.asp. 1 A loop is a segment of pipe that is installed adjacent to an existing pipeline and connected to it at both ends. A loop generally allows more gas to move through the system. 2 A pig is an internal tool that can be used to clean and dry a pipeline and/or to inspect it for damage or corrosion. 3 See the previous discussion on the methods for filing comments.